Members of Congress today are less likely to be immigrants, especially compared with other periods of history when surges of new arrivals occurred, a new Pew Research Center analysis finds. 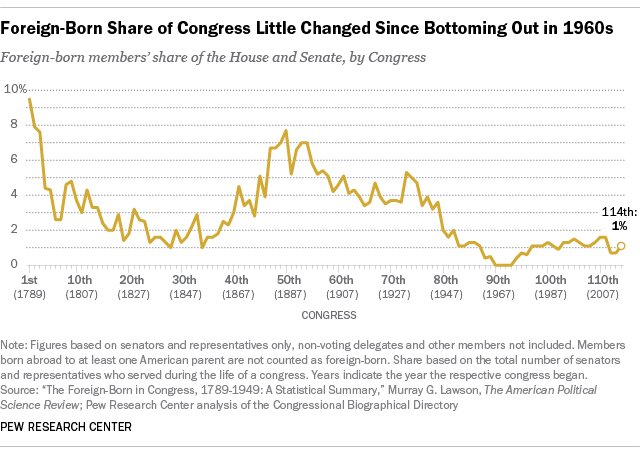 Just 1% (six members) of the current 114th Congress immigrated into the U.S. at some point in their lives, compared with about 10% (nine of 95) who were born abroad in the first Congress of 1789-91, which was a much smaller Congress, and 8% (31 of 407) during the next peak, the 50th Congress of 1887-89, amid the broader U.S. immigration wave from Europe. 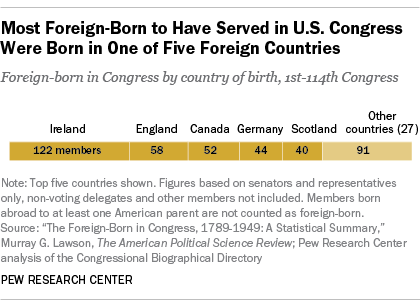 Through history, 407 foreign-born Americans have served as members of Congress (out of more than 12,000 total members). That includes 347 immigrants who served in the House of Representatives, 45 who served in the Senate and 15 who served in both chambers. Foreign-born members of Congress have come from more than 30 different countries, and most of them arrived here as children. The majority were born in English-speaking countries, including Ireland (122), England (58), Canada (52) and Scotland (40). Since 1949, there have been more foreign-born Democrats (27) than Republicans (15) in Congress, according to their congressional biographies. Our counts do not include members who were born abroad but who gained U.S. citizenship through their U.S. parents after meeting legal requirements, such as Sen. Ted Cruz, who was born in Canada, or Rep. Tammy Duckworth, who was born in Thailand (there have been 20 members in this category since 1949). Nor does it include those born in U.S. territories, such as Sen. John McCain, who was born in the Panama Canal Zone when it was under U.S. control. Some foreign-born members of Congress have unique backstories. In recent decades, many came to the U.S. as refugees or to escape the Nazi invasion. One congressman, Tom Lantos (D-Calif.), survived the Holocaust; Samuel Gejdenson (D-Conn.) was born in a displaced persons camp in Germany; and Samuel Dickstein (D-N.Y.) spied for the Russian government. Octaviano Ambrosio Larrazolo (R-N.M.), who served from 1927 to 1929, was the first U.S. congressman born in Latin America (Mexico) as defined by modern-day boundaries. Dalip Singh Saund (D-Calif.) was the first born in Asia (India), serving from 1957 to 1963. And Elizabeth Furse (D-Ore.) was the first born in Africa (in Kenya, to British parents), serving from 1993 to 1999. To run for the House, immigrants are required to have been U.S. citizens for seven years or more, according to the U.S. Constitution. (They must also be age 25 or older and live in the state where they are running.) To run for the Senate, nine years of citizenship are required, and the person must be 30 or older and live in the represented state. The foreign-born are not allowed to become U.S. president. If the speaker of the House was foreign-born, for example, he or she would be passed over for the position should the president and vice president die or leave office. The directory provides information about each member, including their place of birth, in most cases. Because the phrasing that contains this information is fairly consistent across thousands of members’ biographies, we were able to construct a list of members and their place of birth using software to scrape and parse the directory. Using this method, our counts very closely matched the hand counts from the 1957 report, giving us confidence that our counts of the modern-day Congress were also accurate. We also cross-checked our work with other reputable sources, such as the Senate’s list of foreign-born members and recent reports from the Congressional Research Service. Note: Figures based on senators and representatives only; nonvoting delegates and other members not included. Members born abroad to at least one American parent are not counted as foreign-born.